We now carry paddle kits. Stop by and customize a board. Letters are easy to apply - just peel and stick. Hosting a corporate golf outing? How about a visor? A polo shirt? A duffel bag? Or even a golf towel? Hosting a team building exercise at Cooking by the Book? How about a tote bag? An apron? Or a chef's hat? Contact us for ideas about promotional items for your charity event, corporate outing or team building activities. If you have a specific garment/bag/item that you would like to use, provide us the style number and we will try working with the distributor in getting wholesale pricing. E-mail us now for a price quote. We now stock applique letters in various colors for customized sports jerseys. 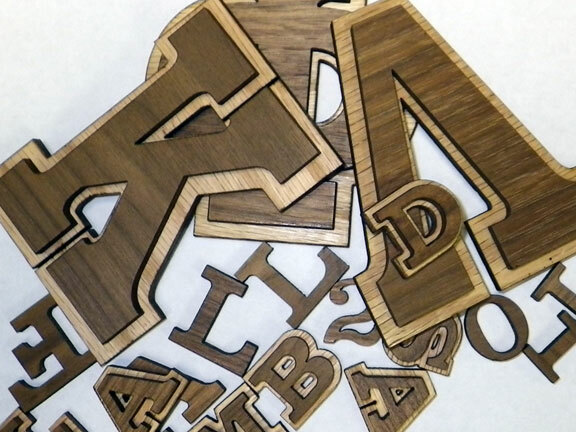 We also have Greek applique letters in stock for your sorority and fraternity sweats, hoodies and tee-shirts. Taking orders now! We have been providing fine custom embroidery to New York City and the rest of the world since 1993. Choose from over 20,000 stock designs and over 150 fonts to create your own personalized embroidery—or have ABCDE convert your original artwork or company logo into embroidery. Call us to confirm hours.